Delphi Construction photo (L to R) are Keith Shaw COO; Rep. Will Crocker; Delphi PX Corey Heaslip; and APM Sue Ellen Walker. Delphi Construction Inc. of Waltham and Cape Cod, Mass., has received a commendation from the Massachusetts House of Representatives in recognition of having won an Excellence in Construction Award from Associated Builders and Contractors Massachusetts Chapter. 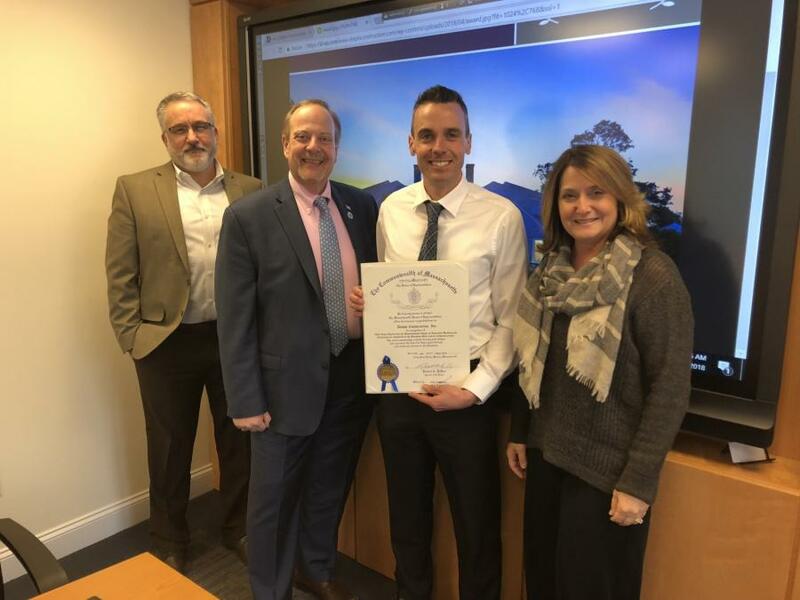 State Representative Will Crocker presented the commendation on behalf of Speaker of the House Robert DeLeo during a brief ceremony at Delphi's Mashpee office. The ABCMA had awarded Delphi the Excellence in Construction Merit Award for its work on a custom residential project in Marstons Mills, Mass. The award-winning home was designed by Doreve Nicholaeff of Nicholaeff Architecture and Design. Corey Heaslip, Delphi project executive, accepted the commendation on behalf of the project team responsible for delivering the project. “Our primary goal is always to exceed the expectations of our client and deliver a final product that delights them, first and foremost. It is an additional honor to be recognized by our industry peers and by our government representatives for our efforts in that regard. It was a privilege to be selected to build this stunning home and to be part of the team together with the owner and architect. This award belongs not only to Delphi but to all who played a role in the successful outcome of this project,” Heaslip said. Robert J. McGovern, director of Public Affairs for The Massachusetts Chapter of Associated Builders and Contractors, extended congratulations to Delphi on behalf of his organization, which administers the annual Excellence in Construction Awards.